Day two of my Heroes of the Old West tribute features the one man on the frontier who doesn't have to worry about werewolves because he's always got a silver bullet handy! The Lone Ranger! 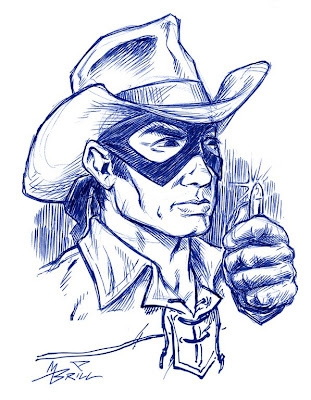 These days he's got a new comic book series with a bigger, badder Tonto and a secret hide-out in a silver mine to help explain his tendency to use bullet that most outlaws would want to be shot by just to get the silver! The old TV series wasn't bad...but it's pretty dated. The movie they did in '81, I think, would have been OK...if it wasn't for the cheesy singing narrator. The cool thing was Tonto, played by Michael Horse, later famous as the deputy in Twin Peaks. Now he's an artist producing Native American fine arts pieces for galleries.